In WW1, the Germans used the A7V chassis as a starting point to develop several other variations. 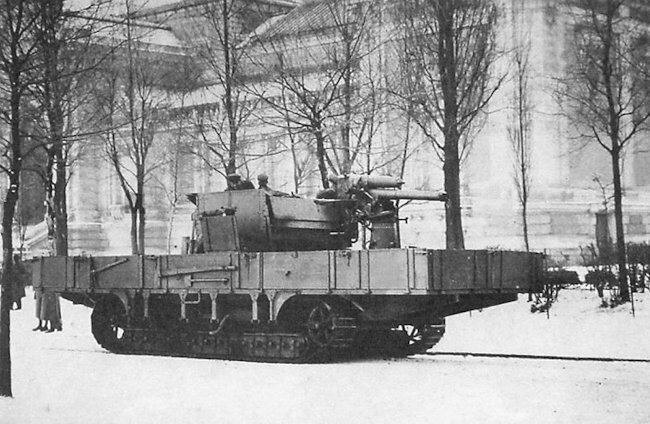 Although most would be used for the A7V Überlandwagen rough terrain tracked supply vehicle, others were used to create unique vehicles, such as a trench digging machine and the anti-aircraft version known as the A7V Flakpanzer. Plans were also made to produce an A7V Funkpanzer wireless communication tank fitted with a Graben-Funkstation 16 radio transmitter and large circling antenna on the roof. In order to combat the ever more numerous amounts of aircraft in the skies, German Army needed something that could fend off the enemy aviators, but also be able to relocate to a more defensible position if necessary. Little is known about this mysterious A7V Flakpanzer save for a few photographs. Three prototypes were being trialed in the closing stages of World War One. The A7V Flakpanzer is the earliest recorded tracked anti-aircraft vehicle in history. The fate of these machines is unknown. It is possible that they were captured by the Allies and scrapped or they were dismantled and the parts were used for other things. The guns themselves were positioned at each end of the platform. Ammo boxes were placed around the driving position and just under the guns themselves. The Flakpanzer A7V was very similar to the Uberlandwagen. It also had the A7V chassis and suspension, with the engines mounted centrally. The driving compartment was placed above them. This compartment was open and unarmored, but had a tarpaulin holder, to be used in bad weather. The cargo bays were extended well over the front and rear of the vehicle, making the Flakpanzer longer. Each of these bays held an anti-aircraft gun mounted on a pedestal. These guns could traverse 360 degrees and could also elevate to fire at enemy planes. Also present were two elevated guard rails, which seem to have had a double purpose. They could keep the crew from falling off the vehicle and serve as sitting places when moving. Under them were the ammunition compartments, which could be accessed from the outside of the vehicle, when the wooden side panels were lowered. The crew consisted of around 10 men. Four men were needed to service each gun. There was also a driver and a commander, although it is not clear if these positions weren’t somehow amalgamated. 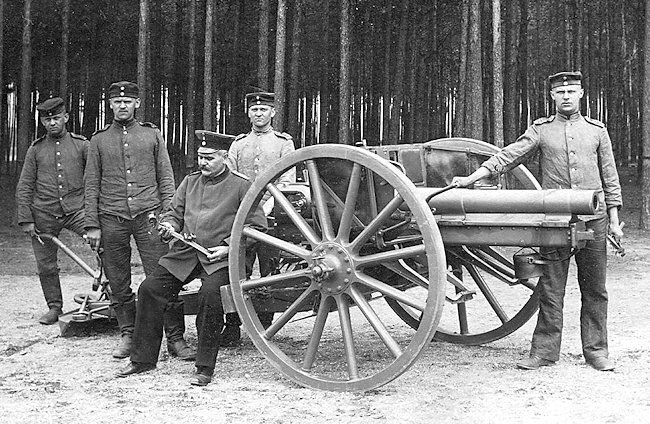 The Germans had captured copious amounts of such guns from the Tsarist Empire and pressed them into service. They even manufactured the ammunition for them. The third prototype A7V Flakpanzer was equipped with a German Krupp-manufactured gun. It is believed that it was a 7.7 cm (3.03 in) German leichte Feld Kanone (l.F.K.) 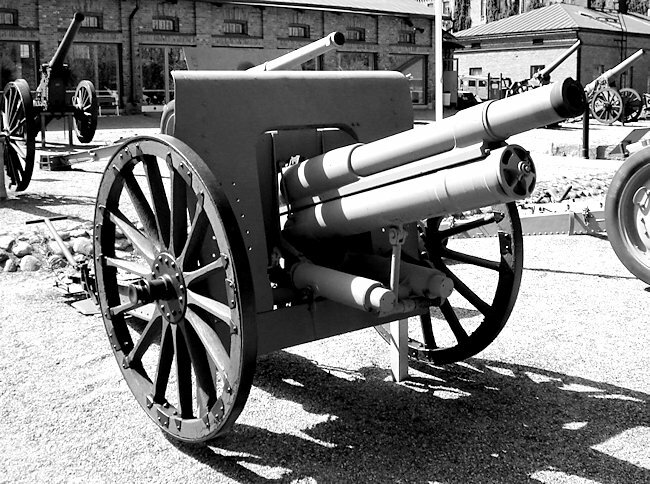 1896 n/a (7.7cm light field cannon). Only one gun was fitted to this vehicle. Whether these guns were effective against their intended targets remains a mystery, as no paperwork related to these guns use has been found. The situation in 1915 – 1916 was dire, as Germany, Britain and France had settled into a stalemate. 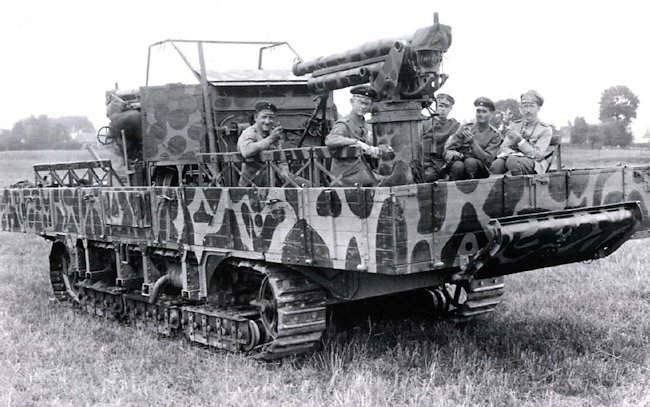 In order to solve the ‘bloody equation’ formed by the artillery-barbed wire-machine gun combination, both Britain and France began development of a vehicle that had the ability to cross trenches with ease and be able to withstand enemy machine gun fire. This tracked vehicle would eventually revolutionize the battlefield. Thus the tank was born. Although the tanks suffered from mechanical failures and inadequate crew training, they had a major physiological impact on the German soldiers. German intelligence subsequently submitted reports to the Oberste Heeresleitung (German supreme command or OHL for short), which then lobbied the War Ministry for an equivalent. However, some of the senior officers of the time were more focused on artillery and infantry tactics rather than the development of the tank or similar armored vehicles. The committee, headed by chief designer Joseph Vollmer, rejected the trench crossing rhomboid shape track system as used on the British tanks because they wanted to build a chassis that could be used on a tank and a ‘prime mover’ heavy artillery gun tractor. This approach lead to problems. Two Caterpillar-Holt tractors were obtained and adapted to build a working prototype. It had a better speed than the very slow British tanks but its trench crossing abilities were not as good. 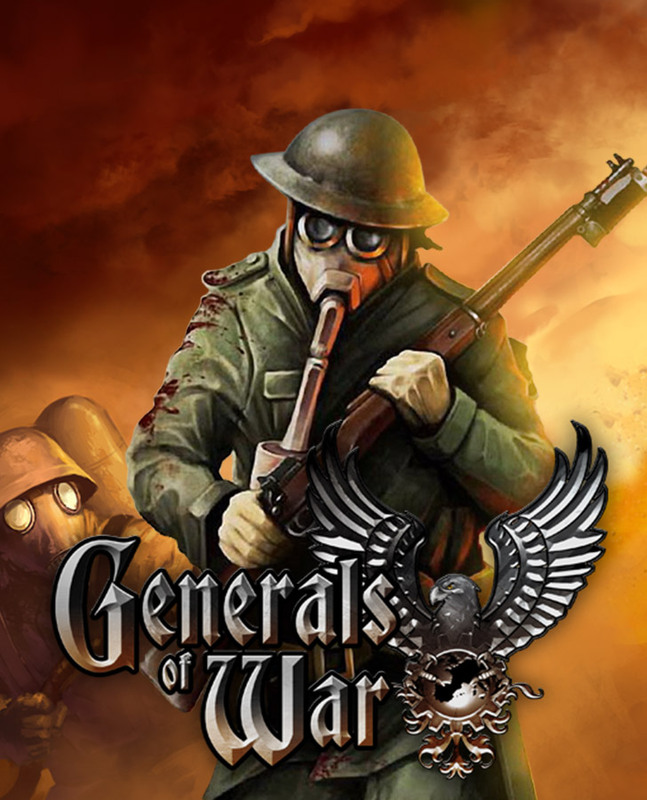 Eventually, the Heeresleitung got some funding from the war ministry to make an equivalent. After months of testing and building, they came up with the A7V. The OHL ordered 100 chassis to be built. The rest were used to develop several A7V variants including the Überlandwagen and an Anti Aircraft version, called the Flakpanzer A7V. 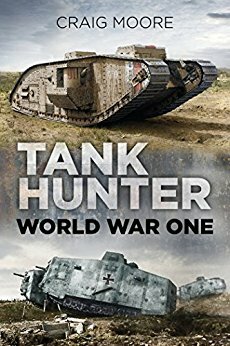 Germany only produced 20 A7V tanks in World War One. Britain and France built over 8,000 tanks between 1916 – 1918. In the battles of 1918 the German Army used more captured British tanks than they did tanks built in Germany. The Germans were not very imaginative when they gave a name to their first tank. The letters A7V stand for the committee of the Abteilung 7 Verkehrswesen (Department 7, Transport) of the Prussian War Office. Captured Russian 76.2 mm (3 in) Model 1902 guns were mounted on the A7V chassis with a new trunnion and elevation assembly to enable the gun to fire at enemy aircraft. 76.2 mm (3 in) Russian Field Gun M1902/30 at the Finnish Artillery Museum. Why are there no colored profile drawings lately? I really loved those 🙁 will they return in the future? Very very interesting article, I never heard of those before. Thank you very much for this! Hello, our illustrator has been on break but once he returns illustrations will be back as usual. Cool article, but why have you guys stopped making renditions of the tanks? Hello, currently our only illustrator is taking a well deserved rest. However we are looking for new illustrators. Good to hear that he’s taking a break. Glad to know people don’t over work them selves. Great Article really interesting vehicle, didn’t know about it before! Just one small correction, you said the tank was named after the 7th Transport Department. The correct translation would be Department 7, Transport. It wasn’t the 7th transport department, rather department 7 was in charge of transport. At least as a native speaker it reads that way, and I’m sure I read it somewhere, too. Hi Chris, Thank you for pointing that out. The correction has been made.